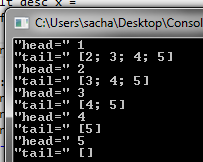 Any serious programming you do in any language will always involve lists. As such you will be pleased to know that F# has very very good support for Lists, by way of its List module. 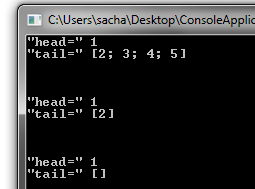 A list in F# is an ordered, immutable series of elements of the same type. In F# there are several ways in which you can create Lists, shown below are a few examples. The last example in the one above showed how to use a for loop to create a list, which is very cool, but there is something even more cool and powerful within the F# toolbox, which are “List Comprehensions”. “List Comprehensions” are a powerful technique that allow you to create lists by using pretty much and of the standard F#, which includes functions/loops/conditions etc. Lets continue to have a look at example of how we might construct lists using list comprehensions. There are also many (too many for one blog, but we will go through a few, for the rest MSDN is actually very on) functions that are available in the F# List module. In fact the MSDN page for the List module is excellent, and has an example for each list module function, as such I would urge you to peruse MSDN for a look at what you can do. Tests if all elements of the collection satisfy the given predicate. In this example the entire list needs to contain 0s to get a true return value. 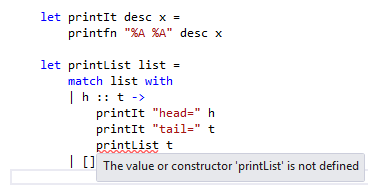 else if (string1.Length  printfn "After sorting:\n%A"
No discussion on F# Lists and pattern matching would be complete without talking about recursion. Now recursion is something I will be dedicating an entire post to, but for now lets see what it takes to write a recursive function that works over a list in F#.